The Imperial Amazon (Amazona imperialis) has a wild population of 250-350 (as of 2012), with habitat loss, trade and hurricanes having decimated the species. Outcomes: Successful local education, land preservation and conservation had stabilized the population of this species. 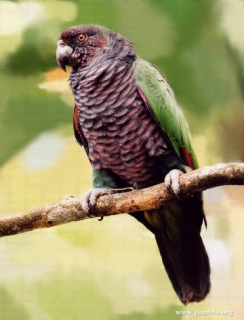 In 2001 the Canadian arm of the WPT donated $289,000 received through the Donner Canadian Foundation to the Rare Species Conservatory Foundation for their work in Dominica. Funds were used for monitoring and field research, a new 4x4 vehicle to navigate the rough roads in the area, land purchases to create a buffer zone on the edge of the national park, and to finish building the Visitor Centre. In previous years, the WPT provided the successful education bus "The Jacquot Express" to teach about the benefits of conservation. In late 2017, the island of Dominica was hit by hurricane Maria at a category 5, effectively wiping out the entire island. The Imperial's population was hard hit, with only 10 birds being located thus far. History: The Imperial Amazon (Amazona imperialis) is native to Dominica, where it is found in the Morne Diablotin area (Raffaele et al. 1998), and North and Central Dominica. A small population has also re-established in the Morne Trois Pitons National Park (Reillo 2001, Wiley et al. 2007, Reillo in litt. 2007). This species numbered only 80-100 individuals in 1993. By 2003 the population had increased to 150 birds due to conservation measures (Reillo in litt. 2003). The total population at present is estimated at 250-350 individuals (Wege and Anadón-Irizarry 2008, P. R. Reillo in litt. 2012). Ecology: Imperial Amazons are found in the canopy of primary mountain rainforest up to 600-1300m (1968-4264 ft) but will descend in response to food shortages or foraging preferences. Birds consume flowers, fruits, nut and young shoots of many trees. They roost communally and feed morning and evening.